The latest top loading generation for the ultimate efficiency in packaging for individual products and collations in shipping cases in the personal, beauty and oral care sectors. A robust modular machine with column design that ensures an optimum accessibility and stability for 24/7 production. 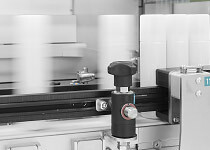 Intelligent robotics and innovative gripper technology cater for any type of application. The top loader excels with its high performance on a very small footprint, intuitive machine operation, wide format range and the shortest possible changeover times.